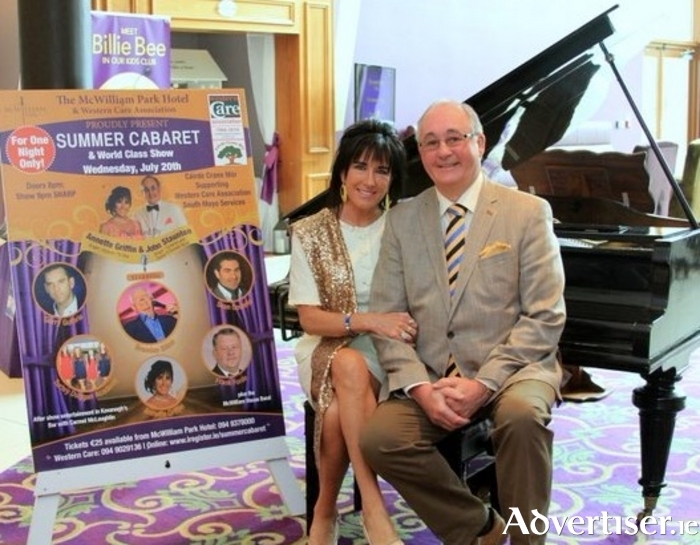 Annette Griffin and John Staunton who will host the summer cabaret in aid of Western Care in Claremorris next week. The summer cabaret show is produced and hosted by Annette Griffin and John Staunton. Annette is resident harpist/singer at Ashford Castle and has travelled and performed the world over. John Staunton is guitarist/singer with Daniel O' Donnell and John has travelled extensively with his music and singing. Great care has been taken to ensure that the artists who perform at the cabaret are world class and joining Annette and John this year are Brendan Shine, accompanied by his daughter Emily, with his style of singing and accordion playing, talented country singer Gerry Guthrie, the super Ballinrobe tenor Sean Costelloe, Castlebar-based comedian Frank Forde, the Riverdance themed Turley/Duggan Academy of Irish Dance from Claremorris, and the excellent McWilliam House Band will be providing support to all the artists. Following the cabaret patrons can finish their night off with dancing in Kavanagh's Bar to the great sounds of Carmel McLoughlin.